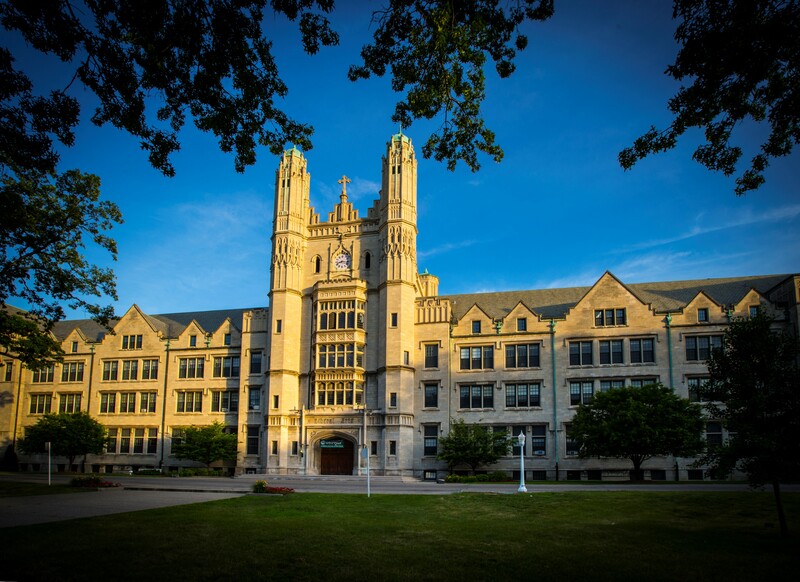 The following outlines The Kresge Foundation’s actions to stabilize and preserve Marygrove College and its campus, a historic educational anchor in the heart of an important northwest Detroit neighborhood. Kresge acted to stave off the college’s precipitous collapse and a raft of potential consequences. Exploring the feasibility of establishing an innovative cradle-to-career educational complex as a potential future use for the property. In February 2016, newly appointed Marygrove President Dr. Elizabeth Burns contacted Kresge President Rip Rapson to discuss a precarious situation unfolding at the college. Burns indicated that the college would be out of cash within weeks and was facing an anticipated $5 million shortfall for the calendar year - this despite an emergency loan made in May 2015 to the college from its founders, the Sisters, Servants of the Immaculate Heart of Mary (IHM), to avoid a similar liquidity crisis. Marygrove College occupies 53 acres in northwest Detroit, serving as an anchor for the surrounding community. Total enrollment plummeted from 1,862 students in 2013, to 966 in fall 2016 (roughly 50 percent undergraduate, 50 percent graduate). The college’s endowment had dwindled to $500,000; endowments at comparably-sized private schools in the region averaged more than 70 times that amount (e.g. University of Detroit Mercy, $43.5 million; Madonna University, $35.8 million; Adrian College, $33.6 million). There was a growing burden of accounts receivables (outstanding tuition balances owed to the college). Marygrove was not an outlier. Across the nation, the independent higher education sector was, and remains, in crisis mode. During the past decade, dozens of private liberal arts colleges have faced financial issues due to plummeting enrollment and weak endowments, causing them to close or pursue mergers. “Our meeting made clear that Kresge had to respond, and rapidly,” says Rapson. Marygrove has held an important role and legacy in urban education. The college had been educating Detroit women since the 1920s. In particular, Marygrove doubled-down on its commitment to educate minority women in the aftermath of Detroit’s 1967 uprising. The college had embraced a role as a progressive force for racial and social justice and healing, both in its immediate neighborhood and in the greater southeast Michigan community. The Livernois-McNichols district in northwest Detroit was emerging as a key place where equitable recovery could take root. Marygrove College has occupied its wooded, parklike campus since 1927. Driven by the college’s status as an educational and cultural anchor in the neighborhood, coupled with Kresge’s recent commitments and investments in the area, the foundation was deeply interested in helping Marygrove shape a course of protection and preservation. The prospect of the college closing and the campus going dark was deemed unacceptable. The damage to surrounding home values, small businesses and other anchors in the district would have been calamitous. “At the precise moment when the community should have been gaining momentum, there was a real fear of being forced backward,” says Rapson. Kresge responded to Dr. Burns’ request with an initial operational support grant of $575,000 to keep Marygrove solvent. That spring, a Kresge-led convening of other philanthropies led to additional grant commitments totaling nearly $500,000 from the W.K. Kellogg Foundation, the McGregor Fund and individual donors. Kresge also committed an additional $2 million to Marygrove for ongoing operational support. DoED – The U.S. Department of Education demanded a $7.2 million letter of credit as a condition of roughly $15 million in Title IV funds (student financial aid). Without these funds, the college would be forced to close immediately. Senior Mortgage – A senior lender’s balloon note of $7.3 million – collateralized by the campus, thus putting it in jeopardy – was due in full on December 31, 2016. The loan was in default, and the lender was no longer willing to amend or extend it. Wayne County – A debt of $500,000 was owed to Wayne County. The county provided this loan to Marygrove so that the college could acquire and renovate the Immaculata High School building for the purpose of creating a new community center. Marygrove was unable to raise the additional capital needed to complete the renovation, and the loan had gone into default. IHM Sisters – A balloon note for $10 million was due to the Sisters, Servants of the Immaculate Heart of Mary. This loan was also in default for nonpayment. The IHM Sisters have, however, remained far more flexible than other lenders and have not called the loan. DoED – In 2017, Marygrove convinced the DoED to accept a letter of credit secured by Kresge for $1.5 million (10 percent, rather than 50 percent, of the Title IV funds the school would receive through tuition scholarships to students) in lieu of sequestering other Marygrove funds. Senior Mortgage – Kresge supported Marygrove’s negotiations with the senior lender, ultimately restructuring the debt with a $5 million loan from a new financial institution (and secured, in part, by a $3.75 million guarantee from Kresge for the balance). The new loan is not secured by the campus. Wayne County – In early 2018, Kresge provided Marygrove a $500,000 loan to pay off the county debt. Meanwhile, ongoing operational expenses and payroll obligations were piling up, and Marygrove requested additional supports from Kresge. And, as the year went on, Marygrove’s situation became more dire as enrollment projections for the fall 2016 semester were substantially lower than projected. Beginning in fall 2016, Kresge made $5.68 million in grants to the college to cover those expenses. In February 2016, Marygrove was within weeks of running out of cash and faced a $5 million shortfall for the calendar year. In spring 2017, Marygrove hired a consultant to conduct an operational audit and to evaluate its recovery plan. The firm specialized in providing consulting services to independent higher education institutions. The operational report was presented to the Marygrove Board of Trustees on August 1, 2017. Based on a thorough analysis of academic program and student support costs, as well as enrollment and financial projections, the firm determined that there was not a sustainable path forward for Marygrove. The report recommended full closure of Marygrove or a drastic reduction in academic program offerings. On August 9, 2017, Marygrove announced that its board had made the difficult decision to cease undergraduate programs after the fall 2017 semester; the college would concentrate on graduate education and graduate professional development certifications going forward. Marygrove would use the fall semester to ensure that every student had an individual transition plan and that faculty and staff had the opportunity to meet with administrators. Marygrove would also use the fall semester to invite other colleges and universities to campus to meet with students and help them identify a fit that would enable them to continue their undergraduate education. Kresge agreed to support the college in an orderly wind-down of the undergraduate program. Operating support for the college’s final undergraduate semester, and preparation for its transition, now included costs such as severance and health benefits for faculty and staff, campus maintenance and security, and numerous vendor obligations. At year’s end (2017), Kresge made a grant of $2 million to fund faculty and staff severance packages, a Student Transition Fund, and consulting support to help the college transition to a solely graduate-level institution. In February 2018, Marygrove introduced the $1.2 million Student Transition Fund, supported by Kresge, to help cover additional costs incurred by students as a result of transferring to another college or university. Roughly 180 former students will be eligible to apply for reimbursement of logistical expenses (transportation, one-time moving, room and board) as well as some academic expenses (tuition rate increases, additional classes required by new school, and others). Today, Marygrove, with Kresge’s support, has satisfied or restructured its most pressing debts. Between February 2016 and February 2018, Kresge’s total commitments to help stabilize and transition the college total $16 million. Marygrove is in the midst of further developing its online graduate education programs and is actively recruiting to boost enrollment and achieve sustainability. Currently, in its first semester as a graduate-only college, enrollment has climbed to 436 students pursing advanced degrees, professional development and certifications in several education specialties, as well as advanced degrees in social justice and human resource management. The 53-acre campus is being transferred to a new body, the Marygrove Conservancy, chaired by Sister Jane Herb of the IHM. The conservancy will manage campus operations and steward the campus as a resource for high-quality uses in the community. Inaugural board members include neighborhood leaders such as University of Detroit Mercy President Antoine Garibaldi and Marygrove President Emeritus Glenda Price. A new body, the Marygrove Conservancy, has been formed to manage campus operations and steward the site for the benefit of the community. Kresge, Marygrove, the IHM Sisters and the conservancy are currently exploring the possibility of a consortium of educational institutions coming together to create a campus comprising a continuum of educational opportunities – from pre-school to K-12 to post-secondary to graduate. Examples of this kind of P-20 campus exist around the country, but are relatively few. These consortiums typically coordinate classroom education with wrap-around services and intensive community-based engagement and programming. A particularly powerful example of this approach is the Penn Alexander School in Philadelphia, Pennsylvania. The Marygrove Conservancy, Kresge and other partners are developing a robust process to engage the surrounding community on the future development of the campus and enlist additional private, public and nonprofit partners. “Revitalization on this campus must, and will, be accomplished with broad and deep engagement from community residents, civic organizations and businesses. Marygrove is part and parcel of the Live6 neighborhood – through its history, its ongoing renewal efforts and its aspirations for the future. Every dimension of community life will be shaped by the activities on the campus. We all have a stake in its success,” says Rapson. The Kresge Foundation is a $3.6 billion private, national foundation that works to expand opportunities in America’s cities through grantmaking and social investing in arts and culture, education, environment, health, human services, and community development in Detroit. In 2016, the Board of Trustees approved 474 grants totaling $141.5 million, and made 14 social investment commitments totaling $50.8 million. For more information, visit kresge.org. Marygrove College is a Detroit-based independent, Catholic graduate institution, sponsored by the Sisters, Servants of the Immaculate Heart of Mary that educates students from diverse backgrounds, fosters values-based leadership, provides innovative graduate studies and professional development toward career enhancement and social responsibility, and serves as an institutional leader within the city of Detroit. Marygrove students, as citizen-leaders, will inspire transformative change in their workplaces, communities, and society through their intellectual rigor and professional excellence, creativity and imagination, active compassion for others, and lifelong commitment to a just, humane, and inclusive world. For more information, visit marygrove.edu.